While in the Pennsylvania Convention Center for ISTE 2011, I came across this intriguing piece of art wedged under an escalator. I took some photos, because I wanted to turn this into a math story. I didn’t get all the shots I needed, so I have to give a big thank-you to Max Ray, who went back and took care of the Act II photos with his girlfriend, who happens to be a photographer and got great shots. The Act II photos containing referents and shots of Max are all the work of Kaytee. Here is my attempt at a three act math story as described by Dan Meyer here. Word document containing all the information I could find about the China Wedge. I struggle with this one. Any feedback would be greatly appreciated. I’ve only one idea so far. 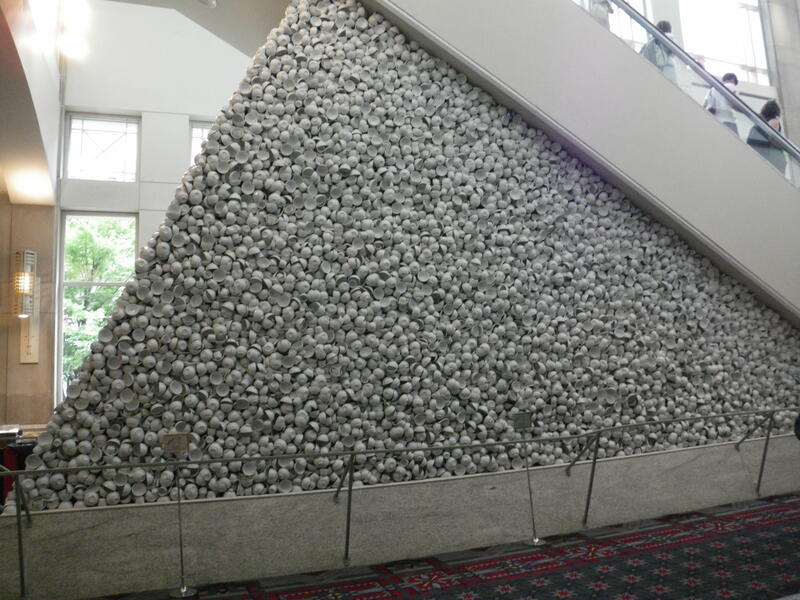 If the entire area under the escalator was filled with cups, bowls and spoons, how many more would have been needed? In his last one of these, Dan asked whether this broad outline is enough for teachers to go by. I know it is enough for lots of us to run with. If you need more details about how to make this work in a classroom, contact me and I will spell it out a bit more. I would present it in much the same way I discuss in my learning through problem solving explanation. That was a GREAT piece of art at ISTE. LOVE this! I am so excited to try to incorporate digital storytelling in my classroom this year 🙂 I GREATLY appreciate the help you have given me with the video and photos here. When you say “It appears that the space is not entirely filled with cups, bowls and spoons, but they go about 2.5 deep all around.” do you meant 2.5 items deep or 2.5 feet deep? Where did you find this info? I’m trying to create a SmartBoard document including all of the images, video and info with related source links. Good question, Sandi. Thanks for pointing out my vague explanation. To clarify, the cups, bowls and spoons appear to be layered about 2.5 items deep. This is simply observational. I can’t find that actual information anywhere. I wonder if the artist would reply to an email.